Mr Jammeh, who came to power in a coup in 1994, suffered a shock defeat to Adama Barrow, who won more than 45% of the vote. 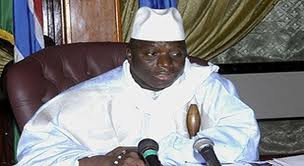 The US “strongly condemned” Mr Jammeh’s statement. “This action is a reprehensible and unacceptable breach of faith with the people of The Gambia and an egregious attempt to undermine a credible election process and remain in power illegitimately,” said state department spokesman Mark Toner.